The last day of the AustroMars Mission saw a final that was absolutely in alignment with this remarkable mission. Beside of the usual communication issues with our primary satellite connection, which is constantly interrupted for very long periods and then starts to work surprisingly again, our Mission Control Center in Salzburg had organised the flight plan in such a way that two teams would explore Skyline Rim in alignment with Operation Edelweiss. After a very nice breakfast, which featured an opinion exchange of what everyone will eat as first as soon as we have landed on Earth again, the first EVA team – officially called “EVA Team 23”, as it was our 23rd EVA – started to prepare itself for the airlock procedure. The team was comprised of Christian Hutsteiner, our Flight Engineer, acting as EVA Commander, Christoph Kandler, the Mission Scientist for Planetary Sciences and Markus Spiss, the Mission Scientist for Life Sciences. While Christian wore the normal MDRS space suit, Christoph and Markus were dressed in the spacy silvery sterilised gown, which is a typical feature of the Tack and Trace experiment. This experiment is set up to quantify backward and forward contamination, an absolute novelty in the Mars analogue science scene. Measuring the backward contamination or the transport of material from outside the Airlock into the Habitat, is done by having an astronaut wearing a sterile cover over its space suits on which specific plates are mounted to collect samples outside of the Habitat and as such to obtain data how much outside material is transported back into the Airlock and/or the Habitat. Contrary, the forward contamination experiment is done with a normal looking space suit, on which fluorescent micro spherules of different colour are applied to the left and the right arm. 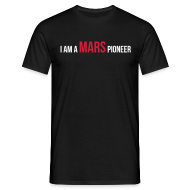 In addition specific places of the space suit are covered with special collectors, which are to accumulate some of these micro spherules to check for cross and forward contamination, which is happening while doing normal activities on the Martian surface. 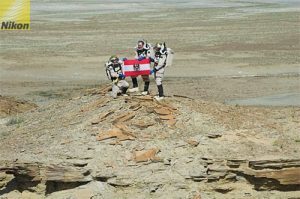 Even though the sterile silvery space suits feature a very bad thermal balance, leading to an enormous heat build-up inside, Christoph and Markus walked up on Skyline Rim with Christian (but then on the other hand these two fellows come from Tyrol and climbing on mountains is part of their daily life anyhow). There they scouted out the terrain in direction to Factory Butte, before they went down again and followed the base of the Skyline Rim in southerly direction. All in all this EVA was very productive, as six samples were collected on top and at the base of the Rim. After a lunch which gathered the whole flight crew at the table, it was up to the second EVA team to move on, form where EVA team 23 had stopped. 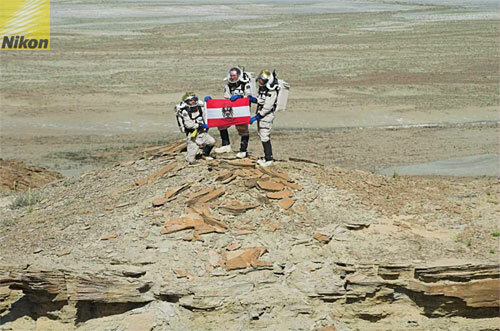 In the mission scenario of Operation Edelweiss, the AustroMars astronauts are sent to Skyline Rim to conduct a simulated spectrographic measurement of a spot at the Factory Butte, which resembles a simulated volcano. The reason for the excursion is that a Martian orbiting spacecraft has found traces of Methane and Water vapour. But as the altitude is too high for the Aerobot and the distance is too big for the AustroMars Rover it is up to the astronauts to conduct the scientific measurements. The second EVA team – EVA team 24 – was comprised of Alexander Soucek, the First Officer, Gernot Grömer, our Health and Saftey Officer – wearing Track and Traces patches for forward contamination quantification – and myself (Norbert Frischauf), acting as EVA Commander. Christian was the HabCom, who we would try to connect via radio once we are on the edge of Skyline Rim. Using the scouted route, we quickly reached yesterday’s waypoints “Kap AustroMars” and “Andreas’ Buena Vista” on the Rim. From there on we moved on to the highest point of Skyline Rim at coordinates NAD27 UTM 14250980m N, 515293m E at an elevation of 1547.1 m. We conducted our simulated spectrographic measurement of the volcano from there – the results are currently analysed by our scientists. To remember the great effort that was required to get there we created a waypoint at the spot where we conducted the measurements and called it “Edelweiss Peak”. Such as yesterday, we were today also able to establish direct radio communication with the MDRS from the edge of Skyline Rim. But as the quality of the signal was today only bearable and sometimes communication could not be continued at all, any crew that intends to follow our footsteps, continuing the exploration of Skyline Rim, should make sure the radio repeater at Repeater Hill is fixed and operational again. Leaving Skyline Rim, Gernot, Alex and I wanted to go to a specific point at the Tank Wash to obtain some geological samples. Unfortunately we had to abort this EVA on the way to the geological site because of radio communication problems. Now we are all in the MDRS again, packing stuff and preparing for our flight home to mother Earth. This last evening is of course something special and we intend to celebrate it in a way that none of us will ever forget it. By tomorrow we will be free to open the door of the MDRS again and immediately thereafter we will meet our On-Site-Support team, Johannes Nendwich, René Vidalli and Johannes Gross, as well as Andreas Köhler, our photographer. I am pretty sure that there will be a lot of joking and hugging and I am particularly looking forward to all the little stories, which accompanied certain anomalies that we encountered during our mission.